Some new animations ready for the 6.1 update. My current favourite is the "Vessel Status" screen, which was planned since version 5.0. Sadly, the animation never really made it, for reasons I can't remember. 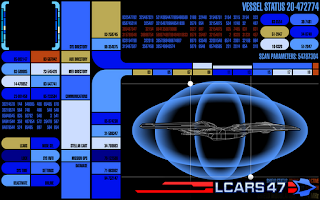 Anyways, it's been revamped, works with Drydock, and has a little inspiration from Star Trek: Generations. On a side note, I'm not sure when version 6.1 will be released, there's a lot of things to fix (mainly the 16,000 frame limit in Flash).